Provides the opportunity to experience the basic knowledge of the robots through graphical interface programming methods. Robo-Robo kit is adopted as the “Creative Engineering Design” course that improves creativity and thinking power of the students. Build more than 20 various kinds of robots as each robot has different functions and properties. Introducing C-series, short for Creative Brick Series based on the design philosophy of “Six-sided Extension, Limitless Innovation”. Taking cubes as basic parts for building projects, C-series products offer students chances to build various three dimensional science projects as they like. Robo-Robo kit is adopted as the “Creative Engineering Design” course that improves creativity and thinking power of the students. Build more than 20 various kinds of robots as each robot has different functions and properties. Taking cubes as basic parts for building projects, C-series products offer students chances to build various three dimensional science projects as they like. 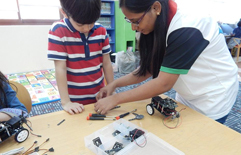 During project designing, building and programming, students can learn more about mechanics, electronics, computing, etc.